You can become a powerful & successful presenter with this online video training! 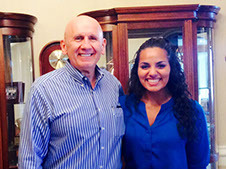 The No Fear Speaking System has been proven internationally with executives, political leaders, and entrepreneurs. 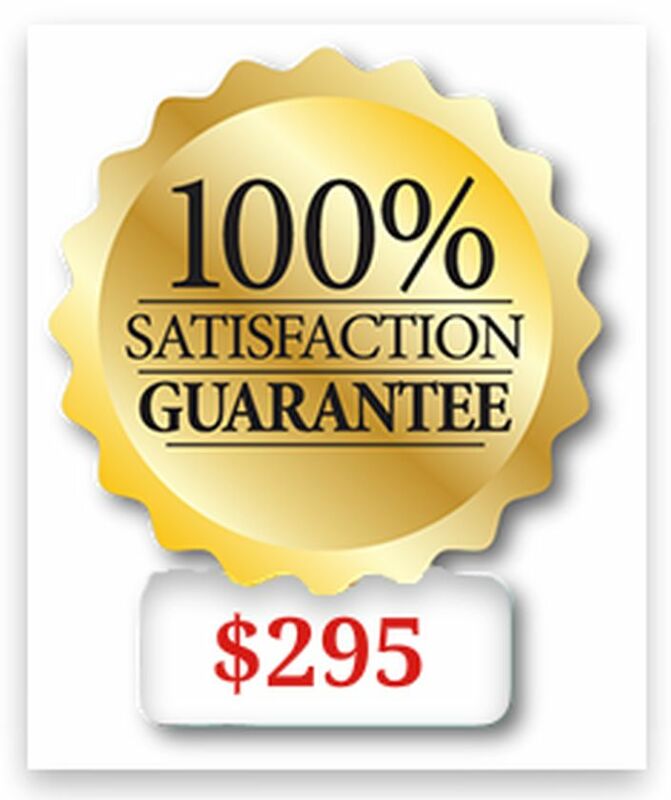 We’re so certain of it’s results, it comes with a 100% full-satisfaction guarantee. 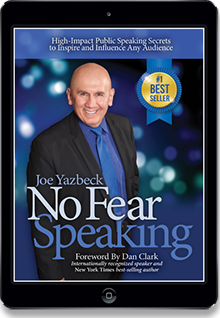 The e-book version of the bestselling "No Fear Speaking"
You will also receive Joe's Quick Reference Guide, a complete collection of all the charts, tables, tips and illustrations compiled from the book “No Fear Speaking” in one simple to use reference guide. If you are looking to organize a speech and want summary illustrations for quick preparation, this is what you are looking for! An easy to search summary of all the key elements of presentation tools condensed together in one reference guide. You will receive valuable tips, articles and commentaries from Joe Yazbeck on public speaking and presentation, leadership solutions to attract, motivate and inspire any audience (live or via media channels) including speaking to your company team, board rooms and peer groups. You can influence people to want your product, motivate them into action, support your cause, and see your vision. So what is the difference between you and the best presenters in the world? Is it their looks? 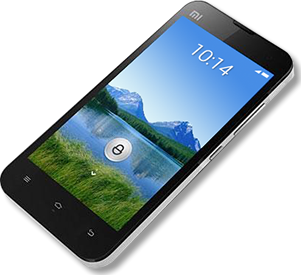 Is it some mystic charm? Or, is it just dumb luck? Actually, its none of those things. The best speakers in the world are excellent, because they have learned to be effective presenters. They do the things that excellent speakers know will inspire audiences. That’s why they have the success and acclaim that comes with being excellent. So, how can you learn the inside secrets to overcoming your fear and becoming a powerful speaker? 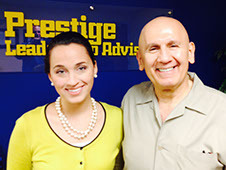 You can learn from internationally acclaimed speaking coach and best selling author, Joe Yazbeck. 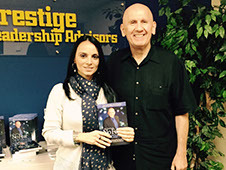 His best selling book, No Fear Speaking has helped thousands of people become more effective presenters. 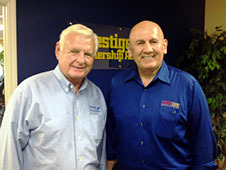 People pay tens of thousands of dollars for one-on-one coaching with Joe. 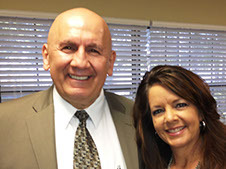 But now, you can get Joe’s coaching and advice using the No Fear Speaking System Online Training Program. You can learn at your own pace, in your own home, at a fraction of the cost of personal coaching. 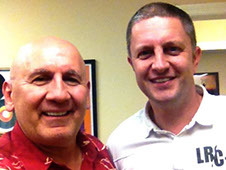 What does the No Fear Speaking System Online Training include? More than just a collection of videos, it is an online course that includes instructions and exercises to develop your skills. 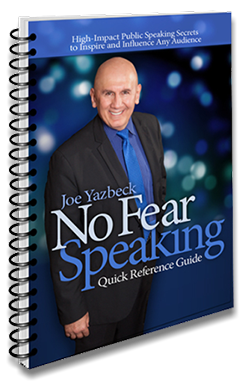 Based on the best selling book, "No Fear Speaking" author, Joe Yazbeck has created a fully organized sequence of videos to provide you with proven techniques that have helped thousands of speakers around the world to succeed. You’ll have all the needed tools, tips, illustrations and exercises to greatly increase your skill and ability. You’ll up your game as a speaker. You’ll be able to deliver presentations for any purpose or size audience. You’ll know what to do whether you have a live audience or are being featured in the media. Effective Speech Design: Creating the outline of your presentation to fully prepare and organize any presentation or speech. Dynamic Speaker Magnetism: Using the key elements of building confidence and stage presence to dissolve fear, overcome stage fright and own the space of your room. Effectively Moving Your Audience: How to inspire, influence and motivate your audience to commit to your product, service or ideas. This includes moving your attendees to become paying clients or customers. Media Communications: The essential tools of speaking on video camera, radio, or TV to enhance your image, PR value and become a more respected and recognized authority in your industry. 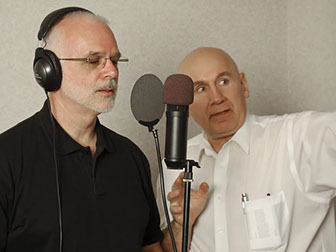 SPECIAL BONUS: After completing your course, you may submit your Final Course Video for a professional evaluation and critique to the No Fear Speaking Training Center to put the polish and finishing touches on your presentation. 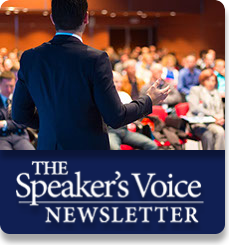 We guarantee that if you use the No Fear Speaking System, you will become a better speaker. If within the first 30 days after purchase you’re not 100% satisfied that you have all the tools to succeed, ask and you will receive a full refund. There is no better investment you can make in your future success. Be smart. Invest in yourself. What will it be worth to you if you simply enhance just some of these speaking skills? How much can you improve your business success? How much additional money can you make? How much higher can your career go? The best investment you can make is in yourself and your future success. And, making yourself a more dynamic and powerful presenter is the best way to assure that success. 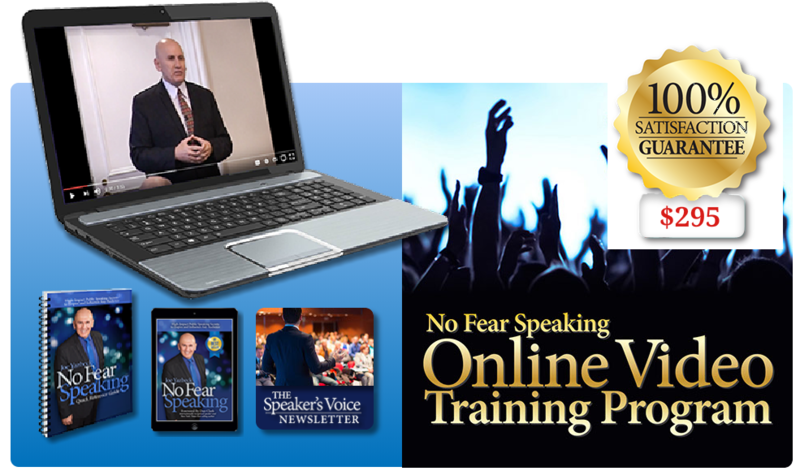 Take the next step and enroll in a No Fear Speaking System Online Training Program. With our 100% Satisfaction, Better Speaker Guarantee, you risk nothing. But you have an unmeasurable amount to gain. Make the decision to invest in yourself. Enroll now. You’ll be very glad you did. After completing your course, you may submit your Final Course Video for a professional evaluation and critique to the No Fear Speaking Training Center which you may use to put the polish and finishing touches on your presentation. Joe's online video courses, coaching programs and workshops have benefited thousands of attendees and students from many countries all over the world. 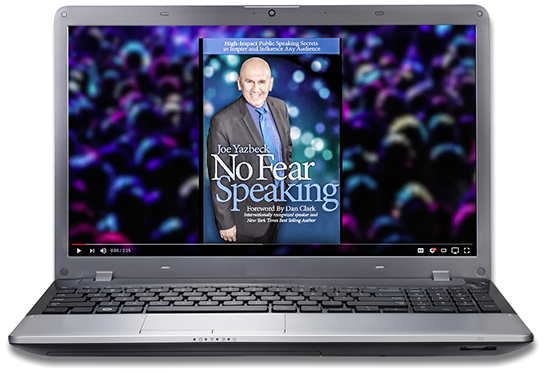 Many students start by reading Joe's "No Fear Speaking" book and then either sign up for the online video training course packages on this page, or opt for personal coaching or training workshops by Joe himself. 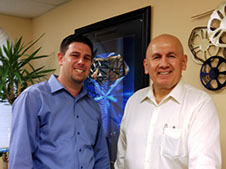 Here are just a few of joe's many successful graduates, who are business owners, executives and professionals from many walks of life and cultures.